Solitaire Central is deeply committed to protecting the privacy of its users. Solitaire Central has created this privacy statement in order to demonstrate our firm commitment to privacy. The following discloses the information gathering and dissemination practices for this web site. Solitaire Central respects the privacy and rights of its visitors. No effort is made to identify individuals without their knowledge. Our web servers automatically log certain anonymous details about each visitor, including browser type, domain name, and IP address. This information is collected solely for statistical purposes and is not used to identify individuals. Most web browsers will accept cookies by default, but they can be set to reject cookies, either from all websites for from specific sites. You can also manually delete cookies from your web browser. These options are generally set through a "Privacy" setting in your browser setup. We may use outside ad companies to display ads on our site. These ads may contain cookies. Cookies received with banner ads are collected by our ad companies, and we do not have access to this information. This site contains links to other sites. 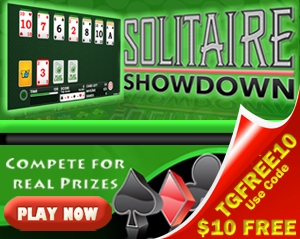 Solitaire Central is not responsible for the privacy practices or the content of such web sites. Other third-party merchants, partners, and services may be added from time to time; please check their web sites for up-to-date policy information.